In “Singularity’s Ring”, the story focuses on one pod in particular, a quintet—considered a rarity in pod society—named Apollo Papadopulos. A student, Apollo is in the fourth state of their education and is competing against other pods for the right to captain the starship Consensus. After a few near-death experiences involving avalanches, the last surviving member of the Community—Malcom Leto, and a sabotaged spacesled, the quintet begins to suspect a deadly conspiracy. The truth though is far more terrible and has something to do with anti-Ring military factions, bioengineered pod bears, the Ring itself—a man-made space station that orbits the Earth’s equator—Exodus, their mentor Mother Redd, and Leto who is trying to establish a second Community. 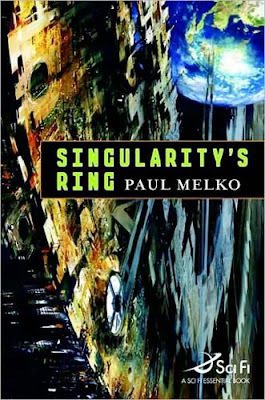 By itself, the plot is fairly straightforward, so what makes “Singularity’s Ring” so unique is the method by which Paul Melko tells the story. Basically, the novel is told through the point-of-view of the quintet Apollo Papadopulos. Now pods may just be clusters made up of human beings, but the way they think and act is completely different from us ‘singletons’, so it’s almost like an alien entity is narrating the book. So, to help readers understand the distinctive nature of a pod, the first five chapters rotate between all five members of Apollo whose first-person perspectives illustrate each individual’s exclusive talents & characteristics. For instance, Strom is the strength of the group and tends to be less vocal and more heroic. Meda is the Interface, the voice of the pod. Moira, Meda’s identical twin, is the group’s moral compass. Quant is an autistic whose specialty is understanding mathematics—she also zones out a lot and can be quite rebellious. And lastly, Manuel is blessed with prehensile feet—he has four opposable thumbs—and a superior memory. Together, they make up Apollo Papadopulos and once we’re introduced to all five podmates and their relationship with one another, the novel switches to a group viewpoint. By then, readers should be intimately familiar with pod culture, which is just a brilliantly executed and original concept. After reading and enjoying several of Mr. Melko's short stories including the opening chapter of this one, I was eagerly waiting for this book and while it's fast and readable, I was somewhat disappointed since it's a very light novel, very YA and good for introduction to sf, but not a major groundbreaking one that would establish Mr. Melko as someone to watch. Though as a good introduction to sf this book will do excellently. Unfortunately, I haven't read Simmons' "Ilium" or the other trademark SF out there that explores a singularity, but I don't think that was the main focus of the book...the pods were, and from that angle, I really loved the concept. Once again, I haven't read "Metaplanetary", and I can see where you're coming from regarding the multiple humans in "The Dreaming Void" being more interesting, but in the latter that was just more of a subplot whereas here in "Singularity's Ring" the entire novel explores pod culture. In general P. Melko is an author that I read any short fiction I come upon and there are several such where I like their short fiction a lot but I am very underwhelmed by their novels, most notable being C. Stross and E. Bear - though for Mr. Melko or for J. Lake for that matter is too early to say after one novel that I liked but not as much as I expected. Another great SFF short story author that sold (I think) a debut that I have big expectations for is P. Bacigalupi. Tony Daniel is also a great short story writer. Two of the best sff stories I've ever read are available free at InfinityPlus "Life on the Moon" and "A Dry, Quiet War"
I admit that I don't read very much short fiction, which is something I need to remedy because it sounds like I'm missing out on a lot of good stuff :)As far as Elizabeth Bear, I've only read a couple of novels which I've really enjoyed, and just one short story by Jay Lake though I'm hoping to read "Mainspring" and "Escapement" back-to-back.